For many students thinking about speaking in the English language in front of an examiner is quite terrifying. This particularly true when you know that you are going to get judged during the IELTS exam. Therefore, several of our prospective students ask us, how to improve IELTS Speaking Score from 6 to 7 & Beyond. The idea of someone analyzing your sentence formation, grammar and range of vocabulary for once will ponder your heart out. Well, what can be done in such a case? This is the common question of many IELTS Training test takers- how to improve IELTS speaking test score? How to improve IELTS speaking from 6 to 7? You can surely improve IELTS speaking by steady practice, improving pronunciation and vocabulary for speaking and of course taking professional help from a certified IELTS trainer. So, here are some tips and techniques for IELTS speaking test that might calm and help you in improving speaking skills for IELTS. Are you worried about getting 6 or 6.5 bands repetitively in your tests no matter how hard you try? It might be because of your same approach towards learning IELTS speaking skills. Some students have the misconception of taking IELTS Speaking test again and again to improve IELTS Speaking without even learning the crux of the IELTS Speaking skills. This means that you must know what to do exactly in every section of the speaking stage to get ‘the desired’ IELTS Speaking 7 bands or more for that perfect IELTS overall score. Let us get started with the basic tips for achieving the target IELTS 7 or more bands by focusing on how to improve English speaking skills for IELTS. There are 3 parts of the IELTS Speaking Test. Part 1 starts with introduction and few questions about familiar topics. This lasts for 4-5 minutes. Part 2 is called Long Turn where the test taker is given a topic and he gets a minute to prepare for the topic. He is then asked to speak about that topic for 1-2 minutes. Part 3 is the discussion part where questions are asked based on the topic of Part 2. To get a high score the students must know the IELTS speaking test assessment criteria that include Fluency and Coherence, Lexical Resource, Grammatical Range and Accuracy, and Pronunciation. It is also a good idea to refer to the IELTS Speaking band descriptors. Fluency and Coherence research how well you are able to convey the message clearly, logically and fluently. A little pause while remembering and structuring words are still fine but overdoing will result in less Fluency and Coherence score. You must be able to create logical sentences that make sense together. How to improve fluency and coherence? • Speak regularly in front of a mirror/ audience/friends to have perfect fluency that will make a big difference to your score. This category measures the range of vocabulary. The applicant is assessed on the ability to select words wisely and in the right context. The test-takers using uncommon words and phrases have high chances of improvement under this criterion. How to improve lexical resource? • Practice rephrasing IELTS questions! By doing this, you will be able to use different words that aren’t repeated. You may take some time to rephrase. How well you form sentences in your IELTS speaking exam will also be assessed. The use of tenses, verbs, nouns, grammatical structures will be evaluated by the IELTS examiner. Therefore, you should show the examiner that you have the knowledge of the English language by avoiding grammatical errors. It is essential to limit yourself from making petty mistakes and it can only be possible by mastering complex sentence structures, verb tenses, and other grammatical features. How to improve grammatical range and accuracy? • The high band in the IELTS speaking test will be achieved by finding your mistakes and then rectifying them. Of course, you might require assistance from the certified IELTS Speaking instructor when you answer the questions or you can catch mistakes all by yourself by recording your responses. If there is a pattern of errors in your speech, bingo! You can correct them and improve your grammatical range and accuracy score. Some students find it extremely difficult to match up with the pronunciation of foreigners and especially when there is a lack of time to prepare for the exam. However, if you are able to focus on pronunciation you will be able to grab those extra granny points. • It is equally important to study pronunciation as you study vocabulary. You may read the Cambridge English Dictionary for British English and the Merriam Webster Dictionary for American English. • Watch official tutorials to see how the native English speaker speaks and try to mimic their speech. What have you learned up till now for IELTS speaking test? The above-mentioned factors are technical and aspiring student must focus on getting all these right to get improved IELTS speaking test score. Coming back to what all we learned about IELTS speaking test is that it is a face-to-face conversation with certified IELTS examiner. He/she will ask you questions on familiar topics related to your work, family, studies etc in part one judging you on the said mentioned factors. The approximate time of IELTS Speaking test ranges from 11-14 minutes. You must not lose composure and try to speak in a cool and relaxed mood. Talk as if you are talking with a friend or a teacher. • Try to talk in English as much as you can. Alas, your speaking must make some sense. Blabbering will not be of any good. IELTS coaching class might help in developing up band scores! A good IELTS score might help in opening many foreign institutions and countries’ doors for you. A slight increase in the IELTS bands can help you in coming close to your desired institution. Thus, it is suggested that the potential test takers should get in touch with the best IELTS coaching institutes in Delhi that can help them in improving IELTS speaking score from 6 to 7 bands. The IELTS trainers are experienced and trained in understanding the weakness and strengths of each IELTS test taker. A one -on -one discussion with the test taker aids the tutor assisting them on how to improve English speaking for IELTS. 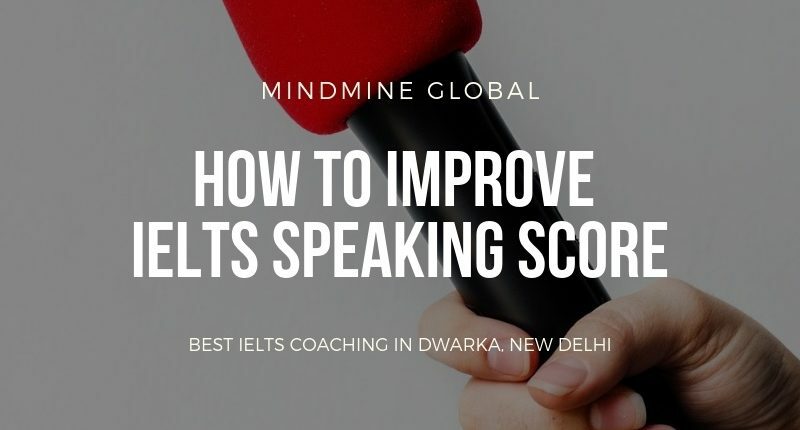 For further information in this regard, you may contact Mindmine Global that provides the best IELTS coaching in Dwarka. The institute has successfully helped the students achieve desired IELTS bands as well as assisting potential migrants to get CLB 9 for Canada PR.